Although she never made it to the White House, Rachel Jackson was the source of as much controversy as any first lady in history. Even Andrew Jackson’s most fervent critics admire him for his devotion to her and his defense of her reputation, which was sullied by the breakup of her first marriage and the timing of her elopement with Jackson. 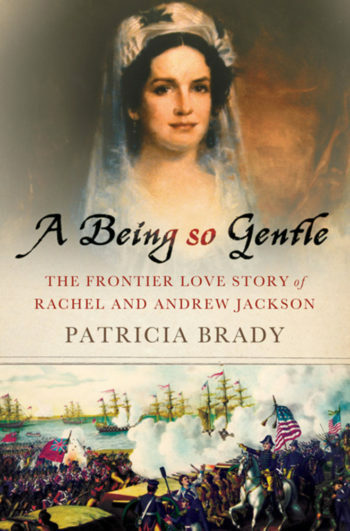 In A Being So Gentle: The Frontier Love Story of Rachel and Andrew Jackson, historian Patricia Brady gives Rachel and Andrew Jackson, and their devoted relationship, new depth. Their story parallels the narrative of the still-young United States, a country in transition, confronted with new challenges and a new view of itself in the world. Patricia Brady is the author of Martha Washington: An American Life, which Publisher’s Weekly called “a splendid biography offers a compelling new portrait of this passionate, committed founding mother…” In this new book, she introduces us to yet another fascinating American woman, who committed herself to the building of the nation, while maintaining her individuality and her independence. A fast-paced political drama combined with a controversial love story that was shocking in its day. A Being So Gentle is, frankly, irresistable.